The Manitou Islands are hosting a celebration October 21 in honor of the 48th anniversary of Michigan’s beloved Sleeping Bear Dunes National Lakeshore. The unique dune climb and stargazing event is a terrific reason to venture to the primitive islands, which are truly spectacular in autumn. Part of an island chain that extends north to the Straits of Mackinac, North and South Manitou Islands are located in the sparkling waters of Lake Michigan near Leland, and are accessible only by private watercraft or by the Manitou Island Transit Ferry. Day trips are scheduled through October 8 on Wednesdays and Saturdays. Autumn provides breathtaking views of the colorful fall foliage amid Lake Michigan’s brilliant blue water and sky. The crisp air is perfect for an exhilarating visit to the many scenic vistas enlivened by wildlife, pristine beaches, and foliage, including stands of giant, 500-year-old White Cedars. Part of the Sleeping Bear Dunes National Lakeshore — a designation from the National Park Service — the islands are almost entirely available for hiking, biking, camping, and climbing. Tackling the wind-blown sandy dunes is fun and great exercise. Both islands are rich in wildlife, beauty, and history. The South Manitou Island Lighthouse and connected keeper’s quarters, which are clearly visible from the mainland, are the most familiar landmark on the island. The 100-foot lighthouse tower marks the location of the only natural harbor between Northern Michigan and Chicago. The existing lighthouse was built in 1872 and was in operation until 1958. In 2009, the South Manitou light was relit as a part of a project made possible by the partners of the National Lakeshore and the new National Park Service Centennial Initiative. Another interesting nautical landmark visible from the ferry but not open to the public is “The Crib,” a 75-foot light tower built in 1935 to alert boaters that the bottom of Lake Michigan has risen to within 20 feet of the surface. For nearly 50 years, a three-man crew lived in the tower. North Manitou is larger, designated a wilderness area, and home to the largest inland lake, Lake Manitou. 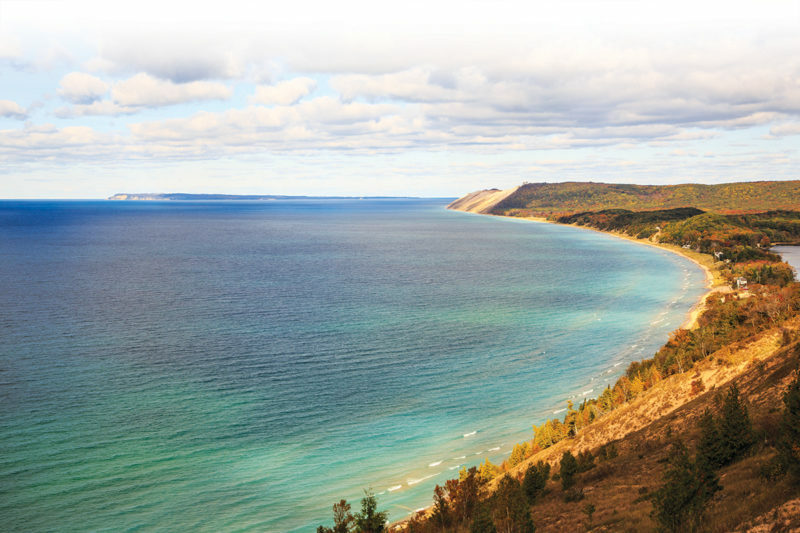 Part of the Sleeping Bear Dunes National Lakeshore, visitors may also enjoy exploring the Glen Haven Historic District and its Maritime Museum. – “Paddle the Platte,” an easy, four-mile paddle down the Lower Platte River. Participants can bring their own canoe or kayak or rent one locally. The programs are free, based upon availability, and subject to change. Park passes and camping fees are required and can be purchased from the island ranger stations. The Philip A. Hart Visitor Center in Empire is a great resource for those planning a visit. Here, visitors can view a helpful slideshow, speak to a ranger for advice about things to do that match their interests, and embark upon an enjoyable fall journey amid the Manitou Islands.